The different options in terms of artificial turf are endless and a person would only be limited by their own imagination. Artificial grass is for one, very low maintenance and is pet friendly, all you will have to do is pick up what the dog left beind and then spray your lawn, it should wash away in seconds. It is also very helpful for people with allergies,in cases where children might be allergic to grass, synthetic lawn is the ideal alternative. Another benefit of this grass is that it can be shaoed to however you choose, there is no design that cannot be accomplished by a proffesional . With the expansion of housing becoming more confined, there is usually only a small area to have outside, so artificial grass can make this much more possible and easier to maintain. If you live a very busy lifestyle and really dont want to have to pay for maintenance, then this is the best type of grass, it stays green, doesnt need to be trimmed and it always look neat. This doesnt only help your houses appeal but also helps not denting your budget. One extra tip that people have used before is that in some houses using artificial grass as the carpet makes things easier, it can be cleaned in seconds and ca add a touch of colour to a room. 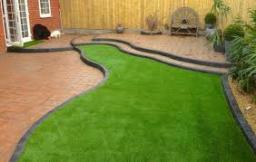 For your own aritificial grass conatct a professional in your area.